Arthri-Flex Advantage + Vitamin D3 , developed from joint nutrition science to support the comfort, flexibility and mobility of the body's joints. 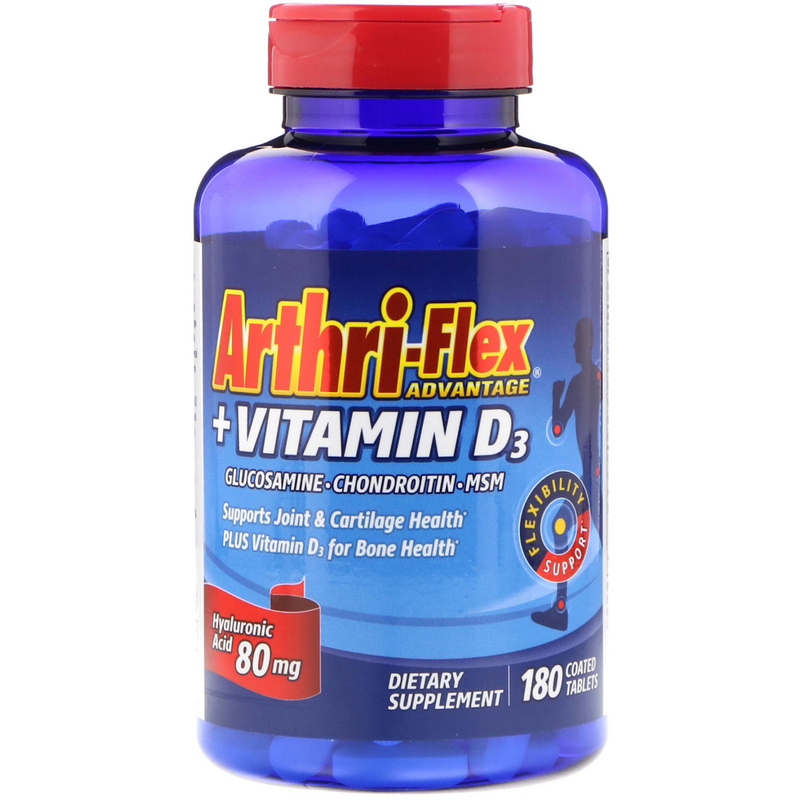 Arthri-Flex Advantage + Vitamin D3 was developed as a multi-nutrient supplement that may support joint health and flexibility. 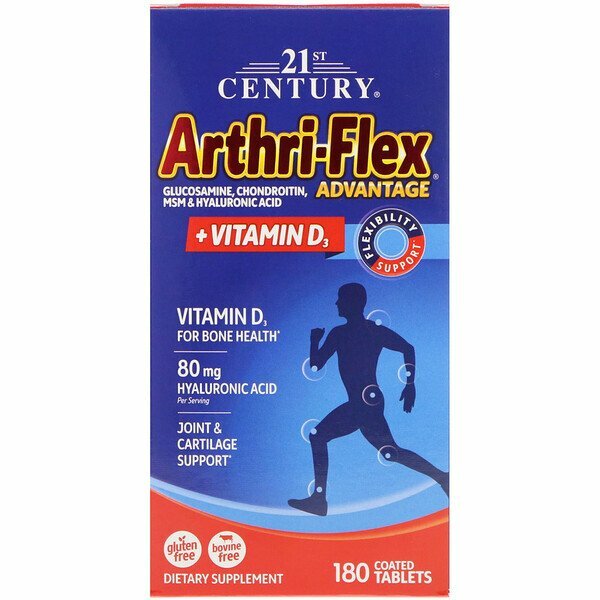 Arthri-Flex Advantage + Vitamin D3 combines Glucosamine Sulfate & MSM (Methylsulfonylmethane) with our Proprietary Blend of premium chicken sternum type II collagen (naturally containing chondroitin sulfate), hyaluronic acid, herbal extracts, and mineral nutrients, that may work in synergy to support both joints & cartilage. Now with Vitamin D3 for its bone support potential. And now with Vitamin D3 to support normal bone health. A combination of glucosamine sulfate and MSM along with our proprietary blend for supporting an active lifestyle. Glucosamine Sulfate Glucosamine supports flexibility and mobility. It also supports the formation of cartilage, an important element in joint health. Chondroitin In joint support applications, chondroitin sulfate helps to support joint fluids and their ability to cushion and lubricate. MSM A source of sulfur, MSM may promote the formation of collagen, an important component in the structure of cartilage and is vital for joints. Hyaluronic Acid This primary component is the backbone of the body's joint lubrication fluids. 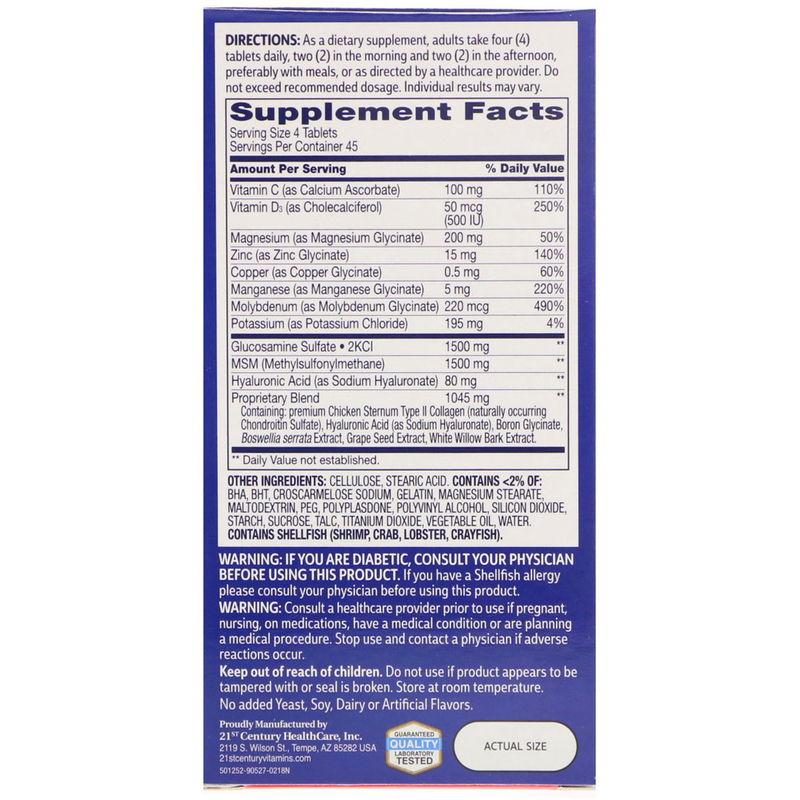 Arthri-Flex Proprietary Blend Premium Chicken Sternum Type II Collagen is a protein that has been studied for its ability to support joints and joint function. It also naturally contains chondroitin sulfate. As a dietary supplement, take four (4) tablets daily, two (2) in the morning and two (2) in the afternoon, preferably with meals, or as directed by a healthcare provider. Do not exceed recommended dosage. Individual results may vary. Cellulose stearic acid. Contains <2% of: BHA, bht, croscarmellose sodium, gelatin, magnesium stearate, maltodextrin, peg, polyplasdone, polyvinyl alcohol, silicon dioxide, starch, sucrose, talc, titanium dioxide, vegetable oil, water. Contain shellfish (shrimp, crab, lobster, crayfish). No added yeast, soy, dairy or artificial flavors. Consult a healthcare provider prior to use if pregnant, nursing, on medication, have a medical condition or are planning a medical procedure, Stop use and contact a physician if adverse reactions occur.